On the night of April 20/21 1943, Halifax JB912 carrying Sgt. Crandell and his fellow 419 squadron crewmates was homeward bound when they were intercepted by a night fighter. The damage to the aircraft was extesive enough that the Pilot Sgt. Jackson determined that they would have to abandon the aircraft which at that point was heading out to the BalticSea. Jackson made a descion to turn back back into enemy territory rather then have his crew could bail out over land rather then the cold waters. At some point after recrossing the coast the bailout occured. In the case of Sgt. Tom Crandell he came down near Eggesin just to the North West of Stettin, which had been their target. A letter from the Department of Defense would bring many emotions and dread to any family who had someone serving overseas. For the family of Sgt. 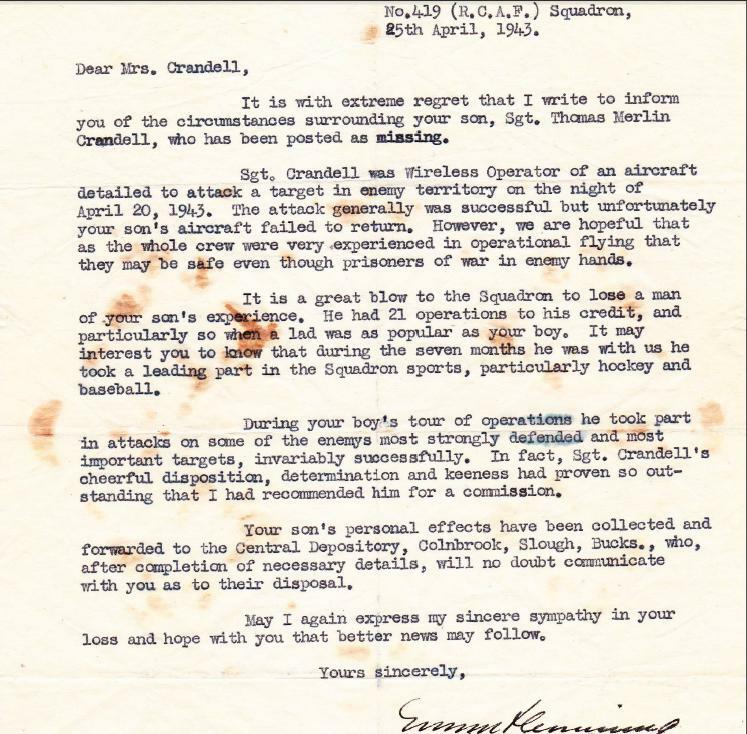 Tom Crandell the letter arriving at their home in the small community West of Toronto must have caused a wave of emotions as they opened and read the report that Tom was Missing in Action while over enemy territory on the night of April 20th. The letter written straight and to the point by W/C Fleming DFC, commander of RCAF Station Middleton St. George, expressed hope to the Crandell family that Tom and his fellow crewmen were safe, although they maybe prisoners of war. 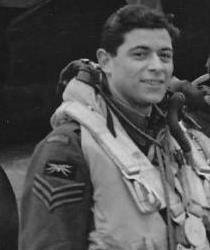 Filling the parent's heart with words on the popularity of their son, his experience, mixed with praise for what he had accomplished with the squadron, on his determination and keenness as well his ( W/C Fleming’s) personal recommendation for a commission. And then a short paragraph, with a disheartening mentioning of the collection and sending of Sgt. Crandell's effects. It would be some worrisome weeks before his family found out through the International Red Cross that he was indeed a POW in Germany. 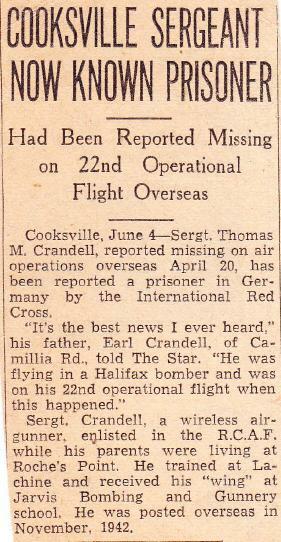 By June 4th even the newspapers were letting it be known that the local boy was a prisoner held somewhere in Germany after the failure to return from his 22nd operation. From the post-war interview of Sgt. Crandell, he mentioned that he landed near the German town of Eggesin, just inland from Szczecin Lagoon. It turned out not to have been an ideal location to have parachuted into. For the people of the town and most of the country, the Allied raids had been labeled "terror bombings" , and "Luft Gangsters" was term thrown around at captured airmen. For many captured airmen hostile civilians could mean beatings or worse. For Wireless Operator Crandell the mistreatment he received at the hands of the Gestapo while being held in the run down town jail is well recorded in his interview. He spend many days in this local jail before being transferred to a PoW camp. Days which must have been filled with dread and terror and harsh treatment, and no signs of being released to the military for transfer to a prison camp. The years spent in camp although they were not idyllic, they were most certainly better then the time spent in the hands of his captors back in Eggesin. 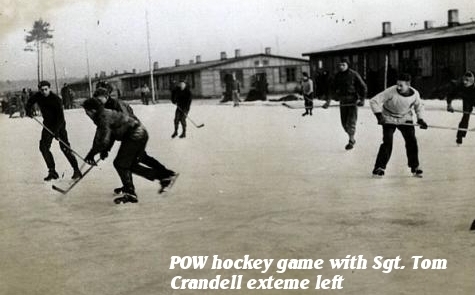 For one thing Tom Crandel was a hockey player and had played with some of the "Kraut Line" during his time in England. Winter time in the camps was a time when the prisoners had the opportunity to put together hockey tournaments with equipment supplied by different means. The camp games gave everyone players and spectators alike a way to forget the terrible conditions and woes of camp life. 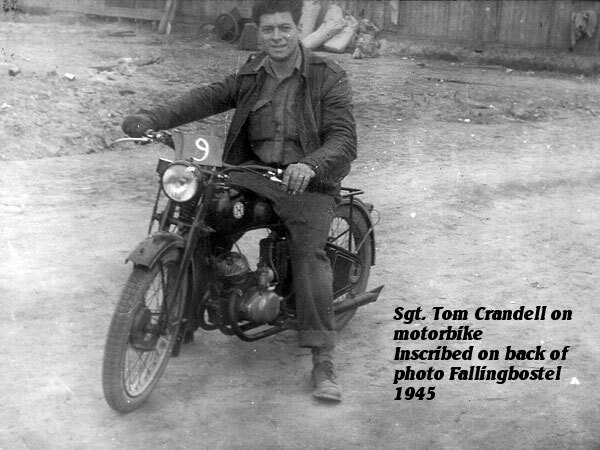 In time Tom Crandell was liberated from his camp, and as the photo shows he was eager for more adventure aboard a liberated German motorbike. Not too sure if he was able to make use of it or not. Most of the former POWs I have talked to said they were strongly warned by their rescuers not to stray too far from their former prisoner camps, as there were still enemy forces lingering around and maybe even friendly forces who may not recognize them for what they were.